What Manifesting Has to Do With Your Business! What is my SOUL SONG singing? Taking action towards your dreams and goals is vital, but it’s not always easy to stay consistent and build momentum. However, taking action is one of those important pieces to the puzzle along with proper planning and the drive to succeed. Those that take action are the ones that see results. How do you motivate yourself to continue working toward your goals, especially when you face challenges? Although some strategies will motivate you more than others, it’s good to experiment with several different ways of finding your motivation. Then, when the chips are down, you can depend on one of these strategies to get back on track. 1. Break your goals into smaller, attainable steps. Especially if you’re working toward a bigger goal, break it up into a series of small steps that you know you can achieve. After each step, celebrate and reward yourself for a job well done. With small steps, you’ll be more likely to stay on task because your rewards come often. 2. Know your limits. You know yourself best and only you can identify your personal limits. If you move too slowly, you’ll know deep down that you could be taking more action. However, when you try to do too much, you risk burnout. Figure out that magic point where you can achieve success without much stress, and you’ll remain motivated to keep taking action. 3. Take away your distractions. There are some things that might be more likely to distract you than others. Remove yourself from these situations when you know that you need to be taking action. • For example, if you’re a social person, perhaps you’ll need to stay away from friends and family during the times you want to work. Also, avoid surfing the net, video games, and television when it’s time to work. 4. Ask for the help you need. Don’t be afraid to get help from others. There’s only so much you can accomplish in one day all by yourself. It’s true that sometimes you’ll have to accomplish certain things on your own, but if there’s any way at all that someone else can help, consider that possibility and ask them. 5. Find an activity that energizes you. Sometimes you’ll find that there’s a period in the day where you go into a slump. Maybe you have trouble starting your engines in the morning, or perhaps it’s the afternoon that causes you to feel sluggish. • In these times, find some activity to re-motivate and energize you. One thing that can energize you is a good exercise routine. It’ll get your heart rate up and send fresh oxygen to your brain. This will refresh you, help you think more clearly, and make you feel more like doing your work. 6. Keep a tight schedule. A good schedule and organized plan will help keep you motivated and on track. In the beginning phases of planning your goals, be very specific when deciding what you need to do and when. This way, when you complete a step, you won’t have to spend time figuring out what you’re supposed to do next. 5 Ways to Find True & Lasting Happiness! Lose the Baggage: Top Tips to Happiness! Last time I talked about the 7 biggest mistakes I see people make while running social challenges. Today, I wanted to offer up my TOP TIPS so that you can make your next (or first) challenge a complete success! K.I.S.S. Keep it simple, sister! I can’t stress this enough. When I work with people on their challenges, their biggest roadblock is overthinking. Think of your challenge as Step 1 or Step 0 before your client works with you. What do they need to accomplish? What win or result do they have to experience. Break that down into 5-10 actionable steps and go with it. Make it flow– If you’re using your challenge to promote or sell a product or service at the end, make sure the challenge has something to do directly with your product or service. You want there to be an easy transition and a clear path. Bonus points if you can name your challenge something that is similar to your program name. For example, in April, I ran the Get Gutsy, Make Green challenge and then promoted the launch of my Gutsy Girls Make Green program. Get them excited– When you start promoting, make a big stinking deal! Get excited, go all out, let people know what to expect. The more excited you are, the more excited participants will be and they will be more likely to share the challenge and invite their friends. Bonus tip: make it easy for them to share by adding social share buttons on your thank you page. Get ‘em where you want them– The whole point of the challenge is to really engage with your peeps. Make sure you are filtering them into a Facebook group or other private forum so that you can actually comment and give feedback on their challenge prompts. You can either use a current group you run or create a group specifically for the challenge. Prizes and giveaways– This is totally optional, but a great way to entice people to actually participate in the challenge once they’ve signed up. There are always going to be people who sign up who don’t show up for the challenge. This is a great way to encourage them to do the prompts and also hold them accountable. Follow up sequence– Don’t let them go just because the challenge is over. Even if you are selling something at the end, the percentage of people who will complete the challenge and buy from you is small. What about all the others? Make sure you have a follow up sequence (sales funnel) in place to continue to reach out to them based on what they wanted in the challenge. This can also be a great way to downsell or upsell those who didn’t bite on your offer. Make it evergreen– If they challenge does really well, you may want to consider making it evergreen and using it as an opt in for your mailing list. Only do this if you get a great response and you know it produces results. If possible, get feedback from participants so you can make any necessary tweaks. So that’s it! My top tips for running a challenge. Are you excited to create your next or first challenge? In the comments let me know what your idea is! She then told me about a personal situation she’s currently dealing with and how she needs to take her own advice and have confidence that she can make it work. I then thought about how I could apply her “rule for success” to my life and realized that my driving skills could use some help. As I’ve mentioned previously, I haven’t had a car since college and driving this past month in LA has been stressful for me. I took a driving class and I’ve been practicing the expert’s advice but what has been missing is my confidence. I decided to apply “the rule for success” to my driving and have confidence that I can make it work. I’ve since noticed that I’m much more relaxed when driving and I’m probably a better driver now that I believe in my abilities. Now I’d love to hear from you. Is it time for you to follow, “the rule for success?” Are there any areas of your life which could improve if you listen to the advice of experts, ask questions if you need to, and then have confidence that you can make it work? We don’t have control over much in this world but we do have control over how much confidence we allow ourselves to have. We might as well give ourselves the best chance for success, no? In the comment section below please let me know about a challenge you are having because I’d be happy to support you as you move forward. As Henry Ford so famously said, “whether you think you can, or think you can’t, you’re right. Find YOUR StrengthsMost clients usually bring me a laundry list of what kind a woman or man they want and what they must have. It’s great to think about the kind of partner you would like and the qualities they must have but it’s more important to understand who you are first. Instead of focusing on the woman or the man, focus on YOU. 1. Focus on the positives of the moment and look for the fun. No matter where you are, if you’re not enjoying yourself you can always make yourself happier simply by looking for happiness. Even if you are standing on line at the grocery store you can pick up a magazine and check out the interesting photos. You can get some extra SMexy points if you give the cutie nearby a big smile and ask them their thoughts on the photos. 2. When you speak with someone, look them in the eye about 70% of the time, which is about how much you look at the road when driving. SMexy people give others their full attention and savor being in their presence. This communicates confidence and interest in a non-verbal way. Most people find this all too difficult to resist. 3. SMexy people look for the good in others, ask them about their interests and assume they can do anything successfully. SMexy people use their smarts to give lots of authentic compliments and are great conversationalists. Others are eager to spend time with them and share their passions with them. When you look for the positives in the moment, smile easily, give others your full attention and readily give compliments you’ll attract more SMexy people than you know what to do with! Below please share your favorite tips for looking and feeling SMexy. I look forward to our discussion ? 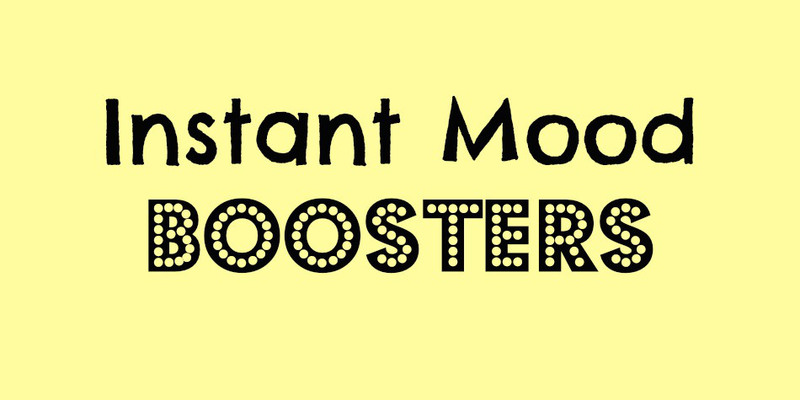 Want An INSTANT Mood Booster? 1. Close your eyes and imagine you are in your happy place. I usually imagine myself lounging on my couch with my animals on my lap because that brings me true relaxation. But perhaps you prefer to imagine you’re on a beautiful beach or listening to your favorite song? 2. Breathe in slowly while thinking of the word “calm” and then breath out slowly while thinking of the word, “peace.” I try to use this one when someone has negative energy towards me and I don’t want to be sucked into their ugliness. 3, Speak kindly to yourself. Whenever I feel challenged and start questioning if I can do something successfully I tell myself, “I’m doing my best and that is good enough.” It is for you too, ya know? Probably the most important tip I can share for instantly boosting your mood is to tell yourself that you love and accept yourself and the future has good things in store for you. Our happiness in any moment is based on what we tell ourselves so we might as well tell ourselves good things, right? So what are some of your favorite instant mood boosters? Have you tried any of these techniques I mentioned and have they worked for you? We’d love to hear your thoughts in the comments section below. Also, if you know someone who might enjoy some instant mood booster techniques please share this post with them! · How do I use Tinder? And make sure my date actually shows up? · Have reality TV romance shows warped our expectations in dating? · When is it really ok to start sleeping together? Does it even matter anymore? The S.M.A.R.T Speaker Series has been created to be FUN, and INFORMATIVE, and this series is unique in that it is set up as a roundtable video series – like some of your favorite panel TV shows. Join me, Damona and the other dating experts as we come TOGETHER to discuss how you can successfully solve your dating dilemmas! She then told ta about a personal situation she’s currently dealing with and how she needs to take her own advice and have confidence that she can make it work. I then thought about how I could apply her “rule for success” to my life and realized that my driving skills could use some help. As I’ve mentioned previously, I haven’t had a car since college and driving this past month in LA has been stressful for me. I took a driving class and I’ve been practicing the expert’s advice but what has been missing is my confidence. I decided to apply “the rule for success” to my driving and have confidence that I can make it work. I’ve since noticed that I’m much more relaxed when driving and I’m probably a better driver now that I believe in my abilities. It’s Time to Ditch That Chip on Your Shoulder! Excuse me for a quick minute, but I have to get this off of my chest! Ok I get it! You’ve been through a lot, in fact you may still be going through it! You may be struggling at work, losing steam in your relationship, suffering with loss or illness, having a hard time financially, the list goes on! However, when did it become ok to take it out on the world? In the past week I have seen multiple people who are stressed or in a low period in their life be completely rude and disrespectful to other people. That is not ok! Struggles in your life do not constitute entitlement to say and do whatever you want to others. Yes, times can be difficult, yes life is not always the easiest, but no you don’t get to take it out on others and then give us a hundred reasons why you are stressed. You are not the only one who is fighting the ups and downs of life. This is just friendly reminder for both you and I that kindness heals everything! Even in dark times, leading with a kind heart will only guide you in the right direction and increase the positivity and love around you (which is what you need in times of stress)! If you really feel bogged down or need support then simply ask and communicate. Instead of lashing out at others do the opposite. Let others know you’re feeling a little overwhelmed or stressed and that you may not be feeling like yourself! Remember, people will stand by you no matter what as long as you are kind! So put yourself (and others if needed) in check and ditch that chip on your shoulder! You’re not the only one going through life! I woke up in a deep sweat the other night panicking about a huge project coming up for Rise Up For You. Instantly my mind went to a place of doubt, “Holy crap what have I done?” “Am I going to be able to make this work?” ” What if the project fails?” “There is a lot at risk and it’s an incredibly bold move, did I do the right thing?” All of these huge thoughts of self doubt came into my mind and created and overwhelming feeling of stress and fear. It took me a few minutes before I could stop my thoughts and talk myself back down to a place of peace and happy talk. I have taken a huge risk in my career and am scared to death! However, I am not going to let it get in my way. I’m going to continue to push forward and see my vision all the way thru. I share this story because I want to remind you that everyone has feelings of doubt and fear from time to time. You are not alone and even the best of the best go through times of questioning and self doubt. As a confidence and career coach I even have them occasionally as shared above. Self doubt never fully goes away however, the question I ask you is, “Are you allowing it to get in your way and sabotage you?” This is the part we want to prevent from creeping into our lives. Fear will come, self doubt will pop up, but are you allowing it to stop you? Yes I had a stressful, restless night of worry. But no I will not stop going after my vision and goal! I will continue to push through and give everything I have to make this future project a success. Remember this story today as you take your next step forward. It’s ok to feel scared but I encourage you to use your fear to move forward. Acknowledge your feelings, take a deep breath, and remind yourself that you do have what it takes.